Parents who are researching educational opportunities for their children often hear about the STEAM curriculum. But what does the term “STEAM” actually mean? STEAM is an acronym for “Science, Technology, Engineering, the Arts, and Mathematics”. It’s a specialized approach to early childhood education that features hands-on learning in all of these interdisciplinary subjects in order to help children turn ideas into reality through activities. 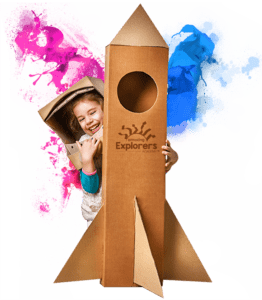 The STEAM curriculum at Amazing Explorers is an innovative way to introduce your child to the skills they will need in the future. By learning about all of these subjects simultaneously in an environment in which hands-on learning and play are combined, children develop a passion for learning they can take with them throughout their educational experience, as well as into their professional careers. By learning these subjects at the same time in a fun, playful atmosphere, children can consider a wider range of perspectives when solving specific problems. Traditional learning focuses on fact-based knowledge. 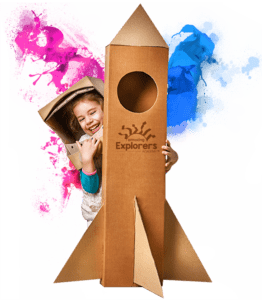 But the STEAM curriculum at Amazing Explorers helps develop the skill sets your child will need to thrive, including flexibility, critical thinking, creativity, and effective communication skills. Scientific studies have shown that most of children’s intellectual development can occur when they are still too young for traditional school. By the time most children arrive at kindergarten, they already have developed learning techniques and habits that they will carry with them their entire lives. At Amazing Explorers, we help children see the world with a natural curiosity so that they can help develop the learning skills they will need to get good grades, graduate with top honors, and have a successful and satisfying career. And it all begins at an early age. Learn more about the STEAM curriculum at Amazing Explorers by calling today to arrange a school tour for you and your child.